It was a bright and clear Winter’s day in 2015 when I left Sydney for a short trip to Ballarat – a city, located at the foot of the Grampian mountains in central Victoria, Australia, which even today evokes the ghost of its colonial goldrush origins in a curious blend of historic and modern. I was headed to deliver a paper at the Australian Victorian Studies Association’s “Victorian Margins” conference, but I was also eager to explore a place so steeped in history. On arrival I was greeted by rain-soaked streets and sodden feet, but even the plummeted temperatures (harsh for a Sydneysider accustomed to mild, sunsoaked winters) weren’t enough to distract from the aged beauty of a city built around broad boulevards, imperial buildings, buttressed facades, and pillared verandahs with ornate, wrought iron cornices. As I trudged through the rain, peering up in awe at the scenes around me, it wasn’t long before I decided it was the perfect place to meet with new friends and exchange ideas about a Victorian past that seemed so vividly to haunt these very streets. Secreted in the ornate, book-lined rooms of the Ballarat Mechanics Institute (the oldest cultural institution in town), and fuelled by a hefty spread of tea, sandwiches and cakes, we talked excitedly of Victorian Melbourne’s bohemia, criminal underworlds, assassination plots and Ballarat goldfield legends. A heavily Australian focus was complimented by papers on the Brontes, my own on Lewis Carroll, and a brilliantly entertaining keynote on the trials of Oscar Wilde by Joseph Bristow. Ideas were exchanged, friends made, future conferences plotted, and the conference was wrapped up with wine and laughter shared over a banquet dinner in the Provincial Hotel, leaving me free to explore the town in the emerging weekend sunshine before flying back to Sydney. With my camera, a warm scarf, and my coat-pockets crammed with hotel biscuits, I set off. Visiting Ballarat is like walking with one foot in the past. 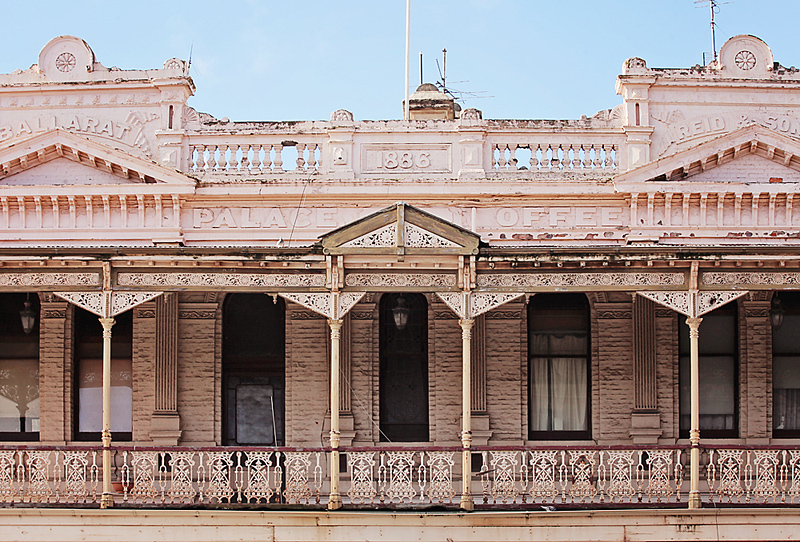 Modern cafes and boutiques peek out from antique buildings with ornate facades, verandahs and dated lintels, painted in soft pinks and fading yellows that are left crumbling and peeling under the harsh Australian sun. Across these porticos dances a ghostly vision of earlier days: a sleepy country sheep station inundated with fortune-seekers at the strike of gold; dusty camps metamorphosed through riches into a bustling Victorian settlement; gold exchanged for stone edifices, showy buildings and carefully planned streets named after influential men and women; prosperity become posterity. In the dual vision of the mind’s eye hovering between past and present, the cars that amble up and down the broad boulevards could easily become horse-drawn drays loaded with gold for the stock exchange. So strong, in parts, is the impression of the city of old that it is almost like the modern cars, cafes and window signs, the Sunday morning shoppers, mirthful children and snappy dogs, are the mirage, overlaid upon the more solid apparition of the town’s origins. To an artist and writer, this was an absolute treasure-trove, and I wandered eagerly through the streets and arcades, marveling at the architecture, the mass of colours and textures, and the web of stories they wove, and stopping in at the many little boutiques, bookshops and cafes that line the streets. Lydiard street was a particular draw-card, containing most of the heritage buildings in town, as well as the grand train hall at Ballarat railway station (one of only three surviving Victorian train halls in Australia). My favourite cafe was The Unicorn on Sturt Street, notable for its down to earth, humble vibes, rustic dishes of delicious vegan food, smooth blues playing beneath the soft chatter of happy diners, and lovely staff – I even got a hug! With the sumptuous architectural and culinary delights of Ballarat tasted, I ventured further afield to the outskirts of town. Between the expansive horizons of the unfolding countryside, the bustling city receding between long lines of old-fashioned houses, my thoughts turn quietly, sadly, to that other lingering shade of colonial past: the memory of the original inhabitants of the region, the Wathaurong people, whose spiritual claims to the land were driven outwards in an expanding settler search for less valuable material riches. Following a path that hugged the edge of Lake Wendouree, which sprawled glasslike under the pale blue winter sky, I was greeted by many friendly dogs and dog-walkers weaving around laughing children braving the cold waters to sail toy boats in imitation of the few larger ones to be seen scudding across the lake. After pausing to finish off a well-earned pastry purchased at a small bakery on the edge of town, I found myself in the gorgeous expanse of the Botanic Gardens under the lengthening shadows of late afternoon. These gardens are spectacular, but the best bit is the stunning glasshouse filled with bright flowers in pinks and creams like a summer lolly. After a few hours lost in the garden’s pathways and blooms, I wandered back along the lakeside to enjoy a final golden sunset glimpsed between gothic trees sprawling over the water’s edge. As evening fell, and the icy winter air crept in, I rode a trundling shuttlebus back into town to see the twinkling lights of The Regent cinemahouse in its evening best. My thanks to AVSA for awarding me the generous travel bursary that allowed me to travel to Ballarat and present my research at the conference. If you are interested in Victorian literature, culture and history, consider joining the Australasian Victorian Studies Association, and attending a future conference!